Bhubaneswar; Sept 30,2016: While the world is abuzz with entrepreneurship and its role for societal development, we cannot deny the role of social innovation in bringing sustainable development with equity. However, innovations are shaped by the ecosystem that harbours it. 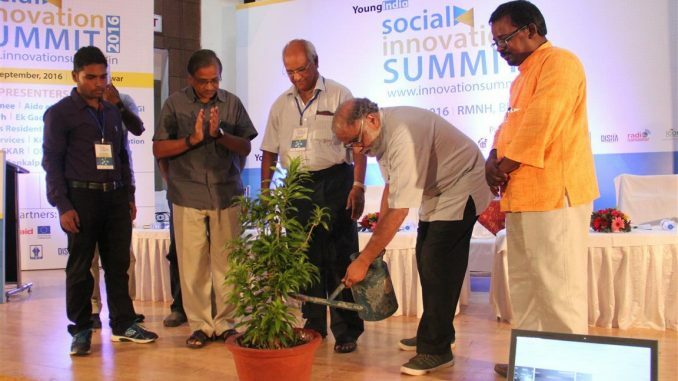 This was the main objective of organising Young India Social Innovation Summit 2016 in the city of Bhubaneswar at Regional Museum of Natural History on last 29 & 30 Sept for two days. Young India with an aim of creation of favourable ecosystem for young people has been instrumental to organise such a program with more than 47 social innovators coming across various parts of the state and country and sharing their innovations during the summit. A glittery of more than 300 resource persons ranging from innovators, academicians, policy makers attended various sessions spread over these two days. This is an effort to bring together those hungry social entrepreneurs not just to talk about their social innovations but to propagate the idea & encourage other young fellows said noted Social Entrepreneur & Community Media Expert N. A. Shah Ansari, Convener of this summit. This summit aims to embrace the public to shape the discourse on social innovations and create an environment for result driven work flows. The summit will witness inspiring talks by noted social entrepreneurs along with workshops and Exhibition & Display of social innovations based on the themes like livelihood, Agriculture, Environment, Education, New Media, and Governance etc from different parts of the country. Social entrepreneurs, practitioners from social/ development sector, academics & students from different institutions have joined the summit. Nationally renowned youth organization Young India is organizing this event in association with like minded social organisations like ActionAid, Lok Bikash, SPAR,Yuva Bikash, DISHA,IIEC etc. In the inaugural session among others Dr. Aurobindo Behera, former Additional Chief Secretary, Prof Madhukar Shukla from XLRI, Jamshedpur, Prof Binayak Rath, Former VC, Utkal University, Debabrata Patra, Regional Manager, ActionAid-India, N. A. Shah Ansari, President, Young India joined and encouraged the gathering with their view on “Ecosystem for Social Innovations – Role of the State, CSO and the Market”. Umi Daniel, Regional Head- Aide et Action has moderated the session. In other thematic sessions more than 47 social innovations was presented in different thematic areas like Education, Agriculture, Environment Governance, Livelihood, Media etc. Among the speakers & innovators Prof Balaram Sahoo, Senior Scientist Mr Gaurav, Education Activist Anil Pradhan, Prof Nirod Baran Khuntia, Advisor, The Coalition for Food and Nutrition Security (India)-Basanta Kumar Kar, Former Add Secretary to Govt of Odisha Santanu Mohanty, Gandhian Activist S.A. Safique, Senior Journalist Jatin Das, Senior Journalist Sandeep Sahu, Founder of Ek-Gaon Vijay Pratap Singh Aditya, Prof Khalid Khan, Social Activist Suresh Bisoyi , Manas Ranjan, Prakash Nayak, Bn Durga, Ashok Das,Basudev Mahapatra, Ananta Prasad, Dr Piyus Rout, Prof D V Ramana, Sibabrata Choudhury, Sanjiv Sarangi, Sugata Nayak, Sabarmatee, Kumuda Satapathy, Animesh Prakash, Dr Shisir Das, Vinit Kumar, Jyoti Prakash Brahma, Sudatta Khuntia talked on different thematic innovations & its need on the present hour. Among the organisers Mohd Niyaz, Ali Rizwan, Andaz Aaron, Vavani Samantaray had lead the whole arrangement of the session. Gobinda Dalei, Co-Convenor of this summit explained their plan to organise this summit in participation of social innovators from different SAARC countries & ensure meaningful interaction & sharing.